Natick Visiting Nurse Association (VNA), a Home Health Compare 5-star agency, has 110 home healthcare nurses, therapists, social workers, aides and staff who care for more than 250 patients a day in 25 communities across the western suburbs of Boston, Massachusetts. Facing rising costs and increased competitive and regulatory pressures, the non-profit, independent agency sought new ways to continue offering the personalized in-home healthcare it introduced to the market in 1899. Most home care patients represent a generation that is still leery of computers and smart phones, because, from their perspective, the focus is often on the screens instead of the people in the room. From an agency perspective, another concern was cost. Laptop technology, ongoing maintenance and IT expenses pushed the average cost per unit near $2500. Even more costly was the possibility of falling behind the technology curve and the potential impact of this on Natick VNA’s hard-earned reputation as a leading home care provider. Natick VNA turned to Brightree, its trusted EHR provider, to discuss a move to Brightree’s next generation home health solution on the iPad. “The home health market continues to evolve and we needed to enlist a 21st-century technology platform to ensure that we were flexible enough to change and grow without impacting our efficiency and productivity, or driving up costs,” said Cofran. Clinicians in the home health care environment are tasked with coordinating physician phone calls, medical supply orders, and lab results while simultaneously managing patients’ families and caregivers. Natick VNA had a clear vision of its future in home healthcare, one that combined the personal touch of clinician home visits with cutting-edge documentation technologies. To move in that direction, the agency worked with Brightree to implement a fast, easy-to-use electronic health record that enables clinicians to document home care on a much smaller device, an iPad, while enabling the agency to innovate and further elevate its patient care. Brightree Home Health software enables caregivers to quickly and securely access patient information even if they don’t have access to Wi-Fi. “The instant access to patient data, with or without an internet connection, was game-changing with Brightree,” says St. Martin, a 30-year healthcare veteran who has seen home care grow tremendously in recent years. Using Brightree Home Health, clinicians now glide through documentation, even multi-tasking along the way. For example, if in the midst of chronicling an in-home patient visit, a caregiver needs to take an important physician phone call regarding another patient’s results, they can now easily jump out of one patient’s record and into another, then jump back after managing the request. This feature increased caregiver productivity by 75% for this common scenario. On-call clinicians in the field can sync up with the agency’s database 85% faster, enabling them to instantly review details about the patient. 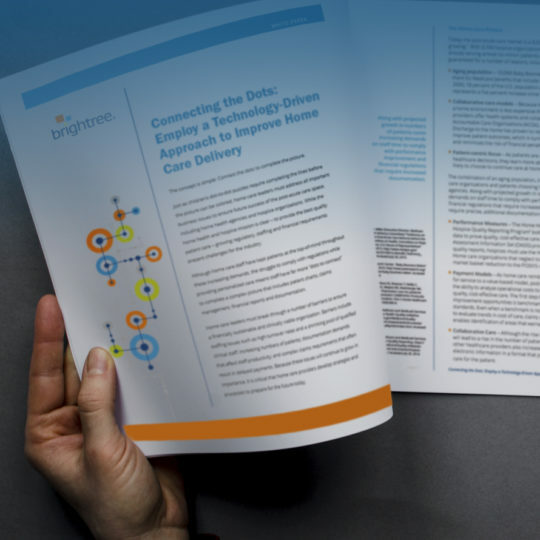 “Brightree listened to our needs and our challenges as a home health provider and they built an innovative point-of-care documentation solution. This solution enables us to have a powerful, positive influence on our patient’s lives,” adds St. Martin. “We’re able to document more thoroughly, accurately and quickly, giving us more time to instill the education, advice, and routines that will help our patients lead healthier lives. We have a short window if time to treat our home care patients, and Brightree Home Health has empowered our clinicians and patients to make the most of their time together,” St. Martin says. “The sheer speed of Brightree Home Health on the iPad has led to exciting, newfound opportunities; and it is enabling our caregivers to leverage their clinical expertise like never before with a focus on keeping patients at home where they want to be,” says Cofran. Natick VNA clinicians have also been able to cut through generational barriers, with the point-of-care documentation breakthrough built on a device that even their patients and their patients’ families consider ‘cool’. “Brightree has revolutionized our patient care with a documentation solution that encourages patient engagement instead of stopping it,” St. Martin proudly reports.